The Maternity Nursing DVD and Streaming Video Series addresses concepts specific to the child-rearing family where the focus continues to be on the family-centered approach to nursing care with a greater depth for understanding of nursing role. The nurse’s responsibilities as a provider of care, manager of care, and member within the discipline of nursing, all which assist the client to progress toward wholeness and the need of client teaching, critical thinking, communication and pharmacology are explored. 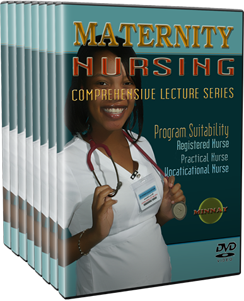 The Maternity Nursing DVD and Streaming Video set is used by instructors as supplemental material, nursing schools as alternative to textbooks and library as special professors reference materials. Individual students aspiring or already in nursing program is a “must have” Maternity Nursing DVD and Streaming Video set. This innovative package of Maternity Nursing DVD and Streaming videos is designed to help schools of nursing to improve their NCLEX pass rate for their graduating students by giving them tools to prepare and review the subject matter more efficiently, rigorously and comprehensively in Maternity Nursing DVD and Streaming videos. It saves you a lot of TIME to learn the entire course of Nursing Maternity from this video set taught by the good and reputable university and college educators. Enables you to learn at the comfort of your home, convenience of your time, desired pace and learning environment that you create. Suitable for students who struggle in class and those who desire highest performance as video series can be replayed anytime. Potential to improve your scores and pass the Exams and bring back your confidence and mastery of the subject matter. Bonus 3000 plus InterActive Practice Exam Questions and Answers accessible anywhere; optional with Full DVD and streaming video package. No more complaining about terrible and hard professors who do not know how to teach; no more bad grades or dropping of classes! Number #1 Educator’s Pick to enhance classroom instruction, increase class retention and boost student success rate. Great for independent students that conduct self-directed learning; make the learning curve smoother and easier. Suitable for individuals with learning disabilities (dyslexia) as it requires more time and patience from both instructors and students. Institutions could stream the videos on their secure platform and make them accessible to students on demand, making learning more convenient.